Have you seen the movie Tangled? It’s a favorite around here. 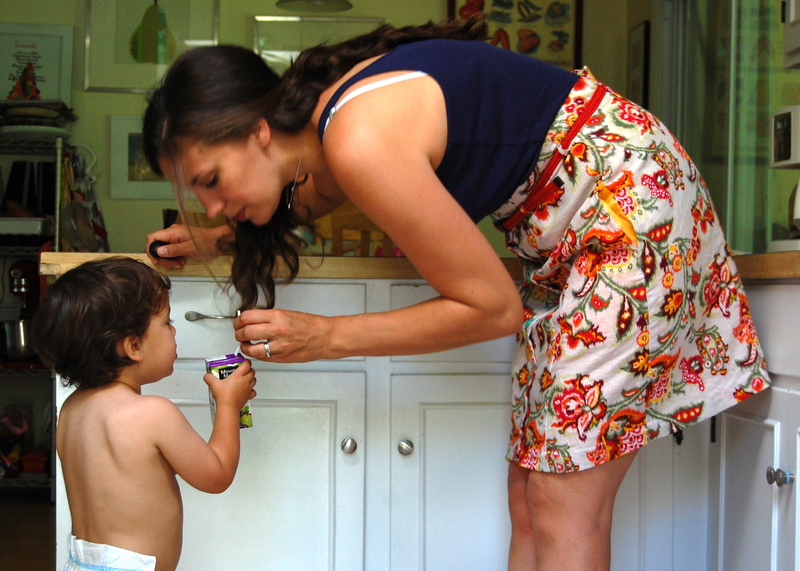 We love to sing the songs and I often quote from it- “Take it from your Mumsie” and “Mother knows best…” and “I’m making your faaaavoriiite! !” are ones I frequently belt out throughout the day. I’m pretty sure Mother Gothel has one of the greatest singing voices in the history of Disney movies. 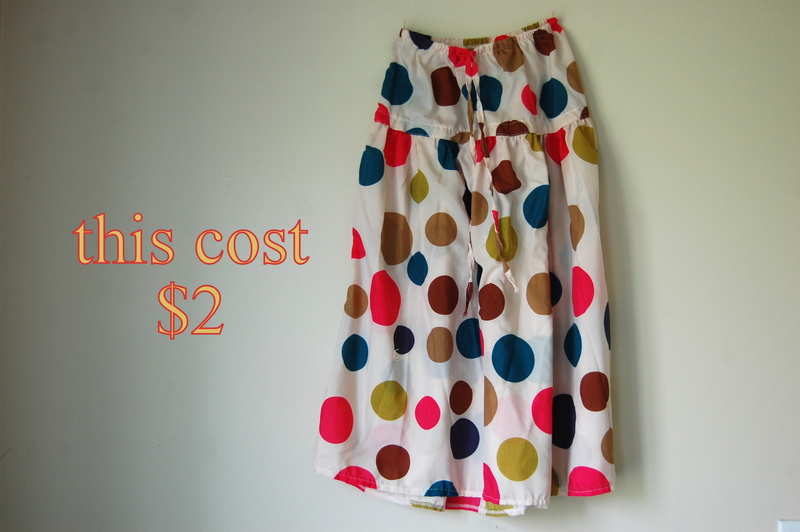 Or in this case, SKIRT. 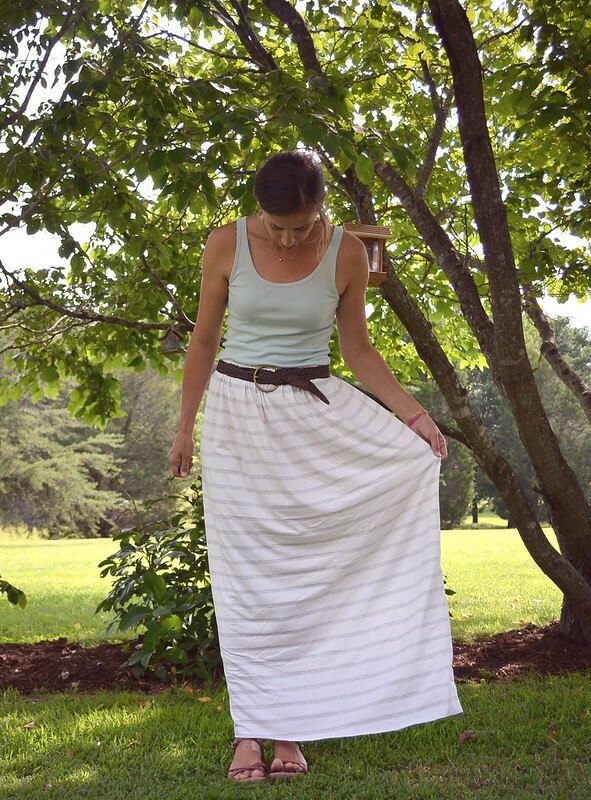 We declare this the best skirt ever. 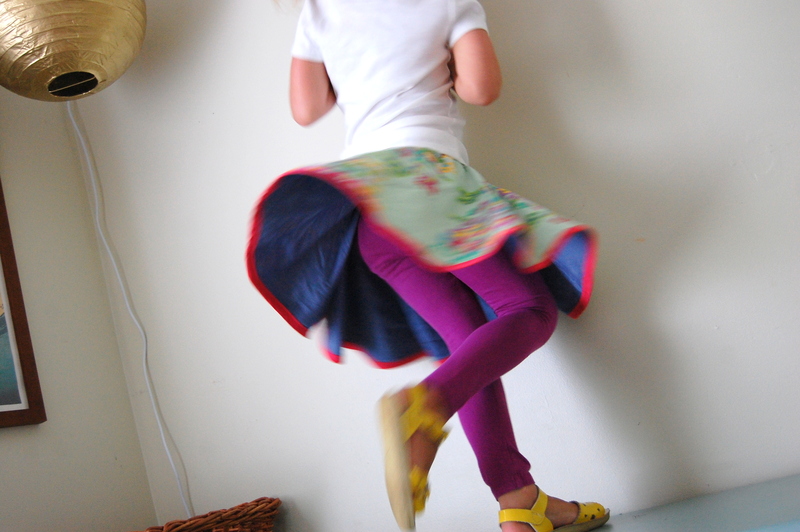 I used the reversible circle skirt tutorial by You and Mie, and guys…it’s a good one. 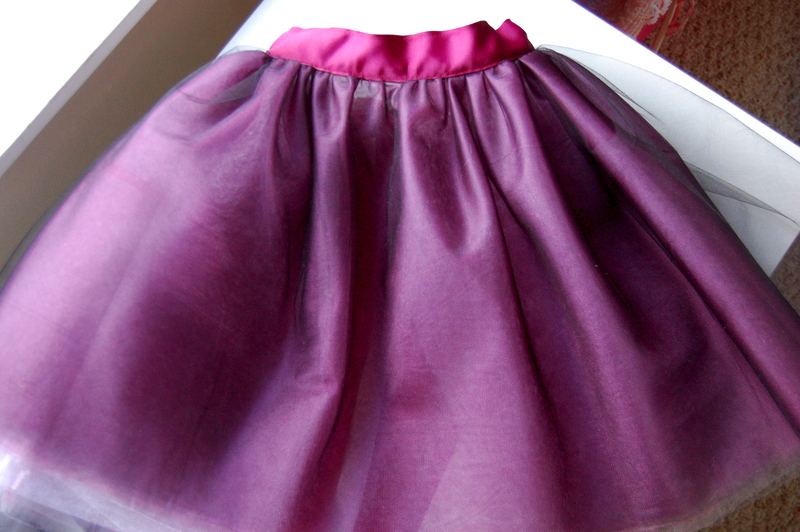 I don’t know why I’ve never tried a circle skirt before- it was so fun to make and just way easier than I thought. 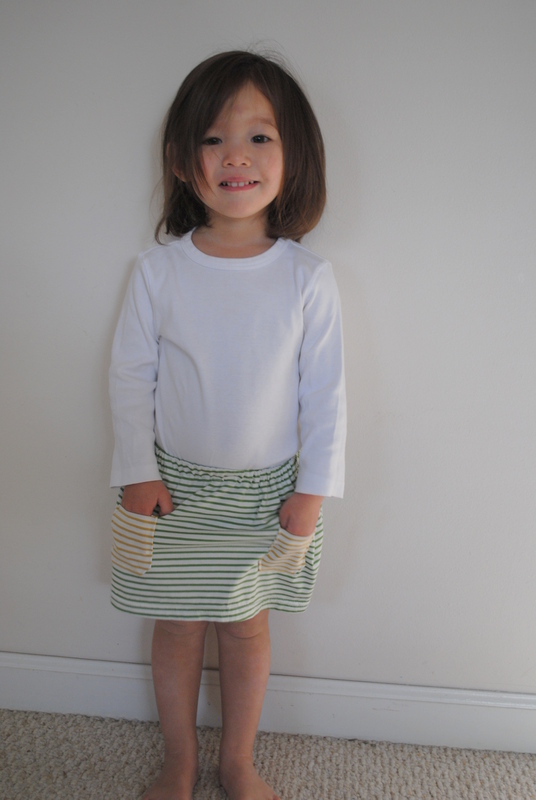 I drafted this little pattern up for a 5T, it was VERY quick to sew- with no hemming required- just bias tape around the botton. And wouldn’t you know it… It used exactly one package of bias tape- with like, 2″ to spare. The outer fabric is Amy Butler water bouquet in mint, and the inside is blue Chambray from Joann’s. Anyway, you can see why Ell loves it! My new go-to for sure. 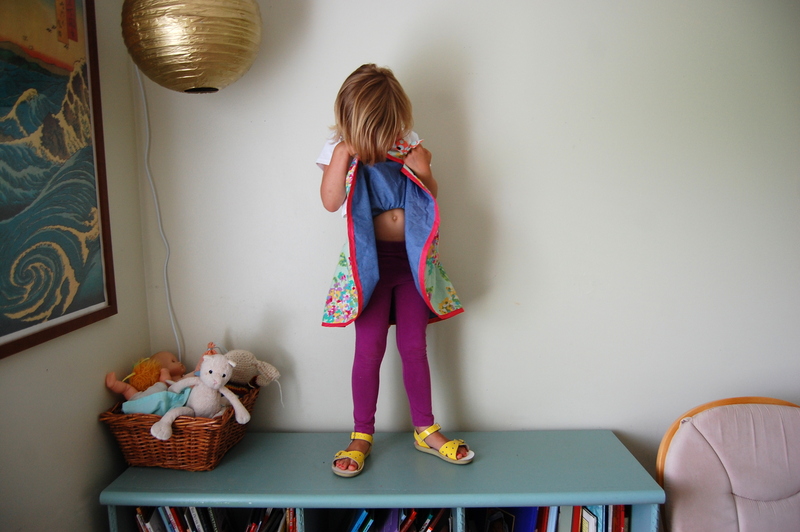 Suddenly, when Ellery turned about 4 years old, all that precious time I spent sewing into the night was wasted. 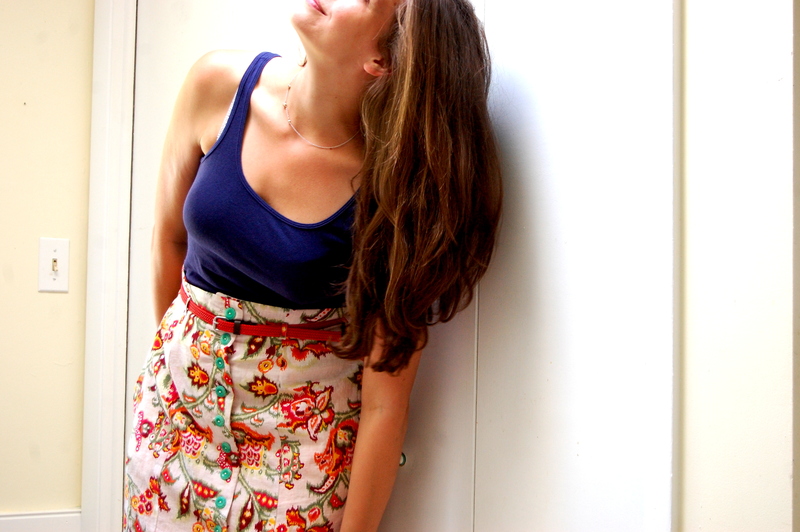 She stopped liking pretty much anything I made (except for this sundress that she all but slept in last Summer). 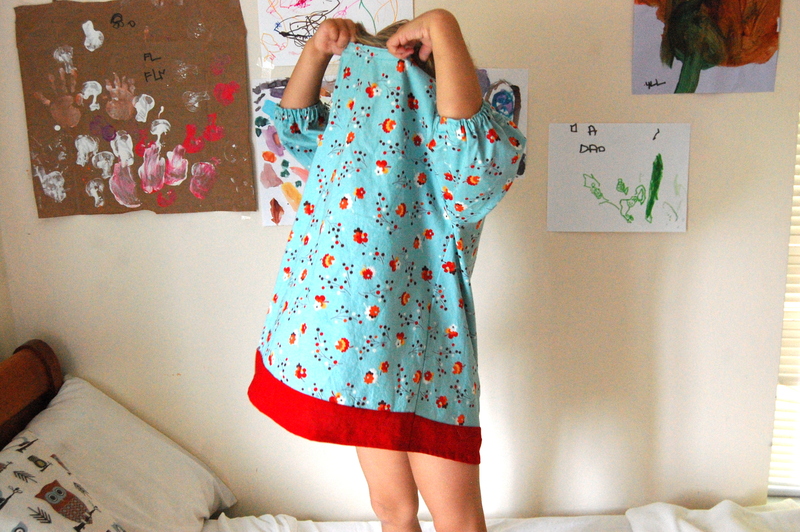 i love this photo of her literally ripping off a Pierrot dress 1 second after she tried it on…. Why? Oh, many reasons…. “it’s TOO BUMPY!!!! !” (i.e. made with woven cotton). Or, “it’s just TOO short!! !” (i.e. it wasn’t a ball gown). Or “I look like a BOY IN IT!!! !” (i.e. it wasn’t the color pink). You can see why the dress above wasn’t her fave… hehehe. So, I found myself buying cheap basic knit dresses from Old Navy and Target. And no offense to those stores (i still do my fair share of shopping there), but if a dress significantly fades after 2 or 3 washes, I’m annoyed. Especially if it cost me over $10. 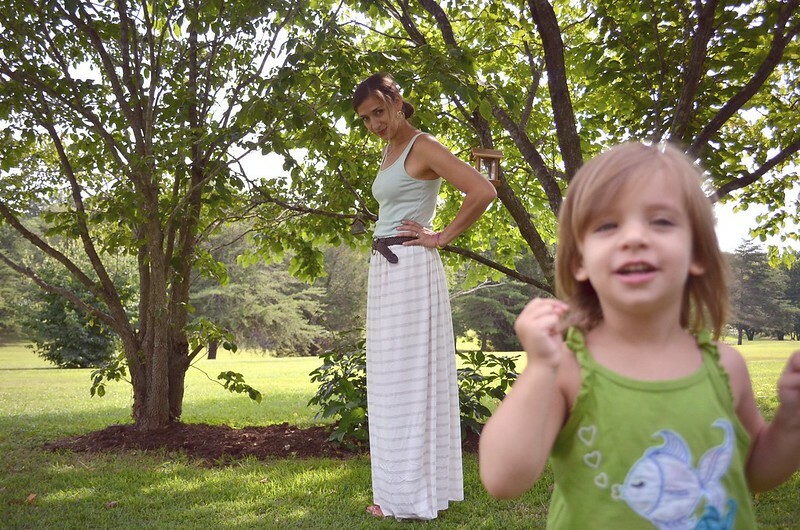 So, I started making these little dresses by attaching an existing tank top we already had to a thrifted skirt or dress, and she just gushed over them. I’m sure she likes them because they are comfy… which means I can get away with some different colors she wouldn’t normally wear. 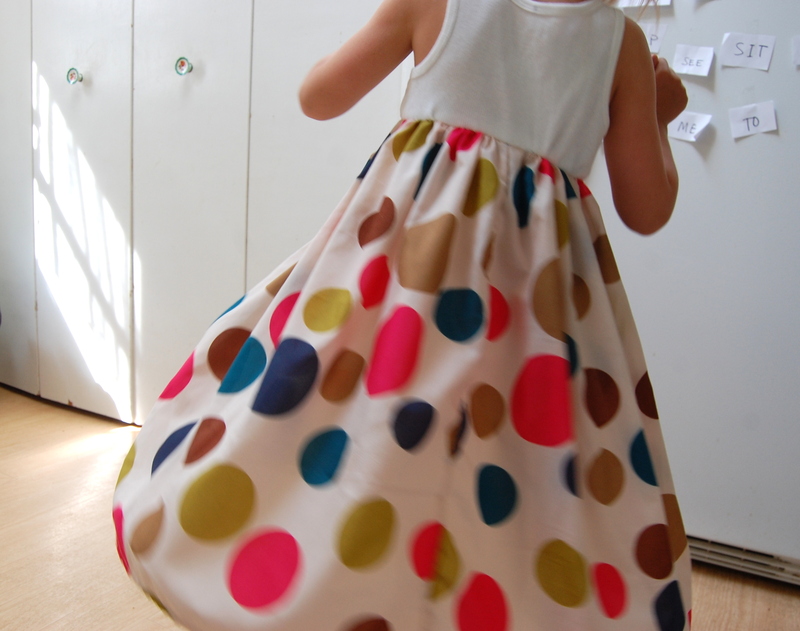 Actually when she first saw this dress she was concerned because there were 2 shades of brown polka dots on it, but she forgot about it once she pulled it on… Livin’ on the edge, my gal! Really. I feel like a cheater, but whatever- I’m so much happier spending about 12 minutes of my time whipping one of these up for a few bucks- as long as she’ll wear it. And wear it she does. About 3 times a week. 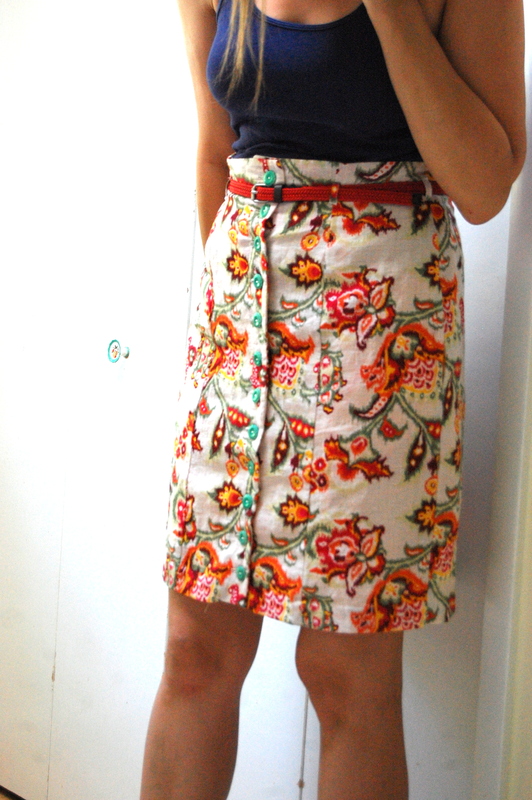 In a slow attempt to update my current wardrobe with some home-sewn flair, I made myself a skirt! 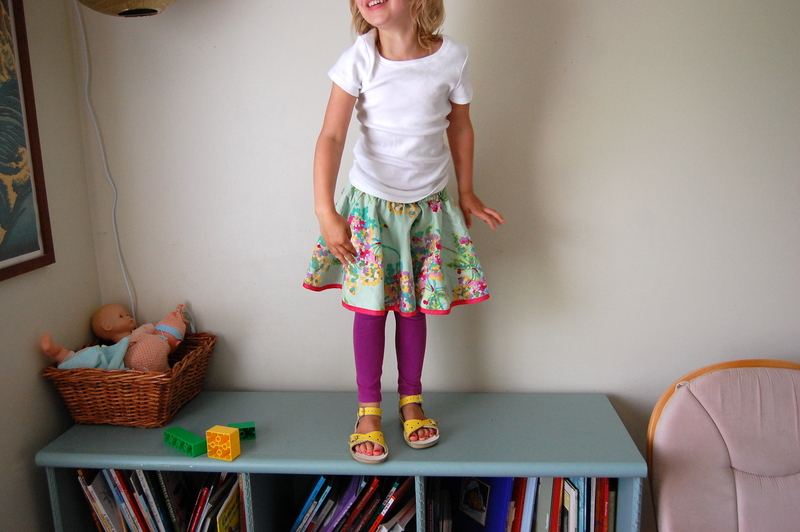 This is the beignet skirt from Colette Patterns. 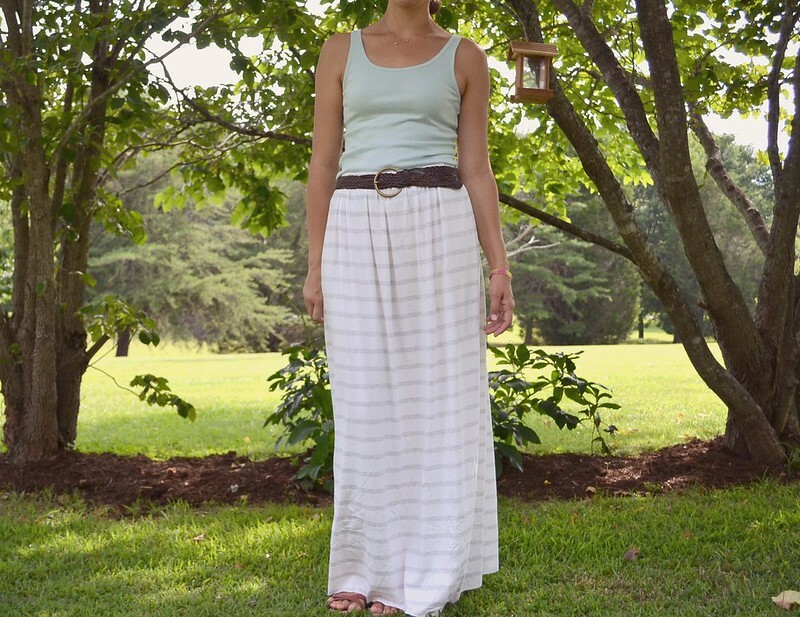 A high-waisted straight skirt with 12 buttons (and…12 buttonholes…yikes ) up the front and a skinny belt. This skirt could also be referred to as “the 7 week skirt” or “the skirt that took 4-eva” or the “put down that beignet and get to sewing me already” skirt. Hmmm….do I look knock-kneed up there? Yikes. I mean, I know I’ve been a little busy… but I cut my pieces out a month and a half ago, and they sat around collecting dust for a bit. Here and there, I got around to sewing it together in the last couple of weeks. During a couple nights of the Hatfields & McCoys mini-series with my hubs, I blew through most of it. All that killing and backwoods family drama motivated me I guess? I made a size up from what I normally wear since I’m post-baby. And like some other folks out there, in the end I decided to forego sewing the belt together since I honestly could not stand to look at my fabric anymore! 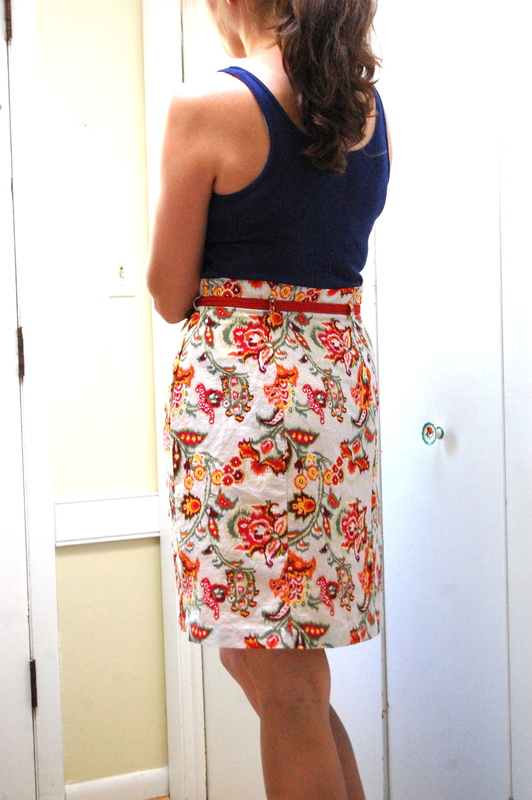 I found an inexpensive braided red one at Old Navy instead- and I think it probably looks better this way. Wow. I need to make an appointment to shave my head this week. STAT. Anywho, I would say this was an elaborate project for me- but, as with all sewing patterns I’ve tried, I learned a heckofalot! Made some side seam pockets for the first time, and also learned how to face and line a skirt- this being the hardest part of the process for me, since 1. 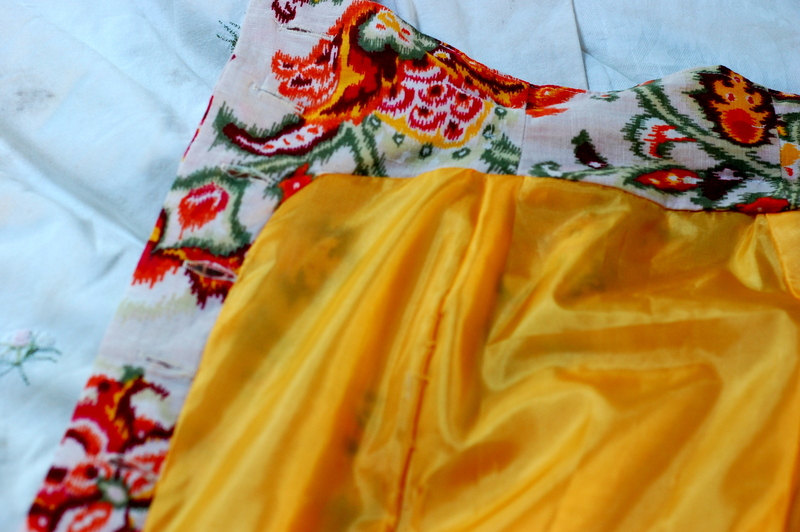 I bought cheap yellow lining fabric that showed it’s cheapness in many ways…. 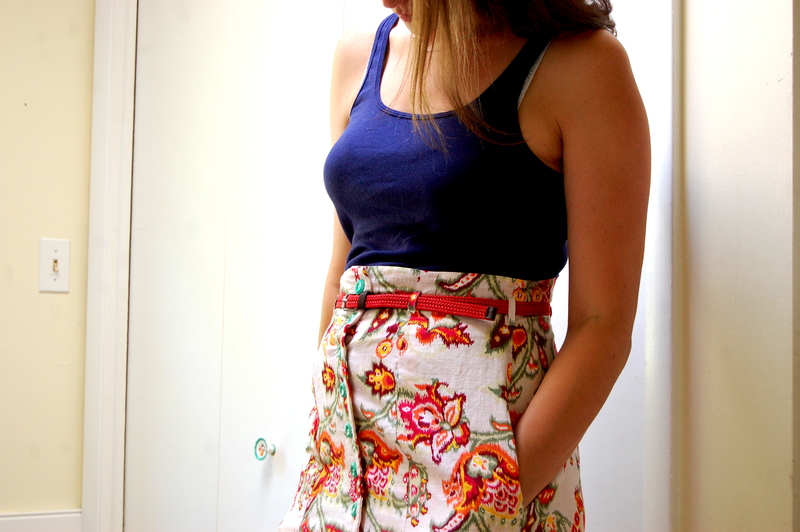 and 2. once I went to sew my skirt shell to the lining, none of my seams matched up. My shell was wider than the lining… so, I took in a few of the shell seams and did the best I could with getting it to match up, but it wasn’t without belting out some of this: @#*$*^*#%&^!!! There’s also a point where you have to attach the lining to the facing at a major curve. See below. I just had to go super slow… and it came out okay, but probably not perfect. My buttons were a small splurge- but I really love the jade color. I was a little hesitant to use them because maybe they don’t quite “go”…but i’m happy I did. I’m not all for “matchy matchy” things anyway, and plus I need more color in my closet like nobody’s business. I will say, this pattern was challenging for me, but defintely well-written… I plan on making another someday, maybe for Fall… though I’d choose a heavier weight cotton. Mine here is almost linen-like, and I did have some slight issues (mainly when it came to the buttonholes) because of that. And like I said, I used cheapo lining material (don’t be like me- do a little research on lining options!) but I do like the little glimpse of yellow poking out of the pocket. Now. Can i blatently show off the REAL (adorable) reason this took me so long to make? I may have mentioned before that my adorable mother-in-law, Arlene, is a bit of a shop-aholic. Like everyone, she loves a great bargain, and like most grandmothers, she loves to spoil her grandchildren. 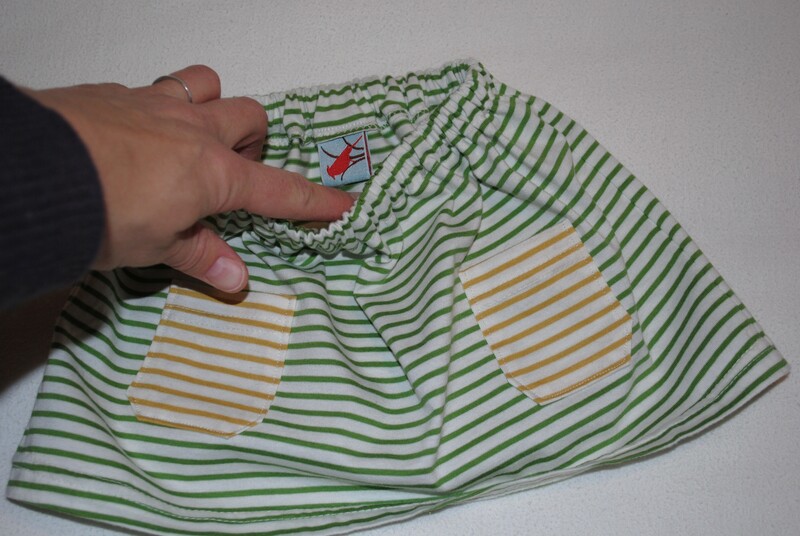 Every few months a package arrives that is packed with kids clothing. Awesome, I know! 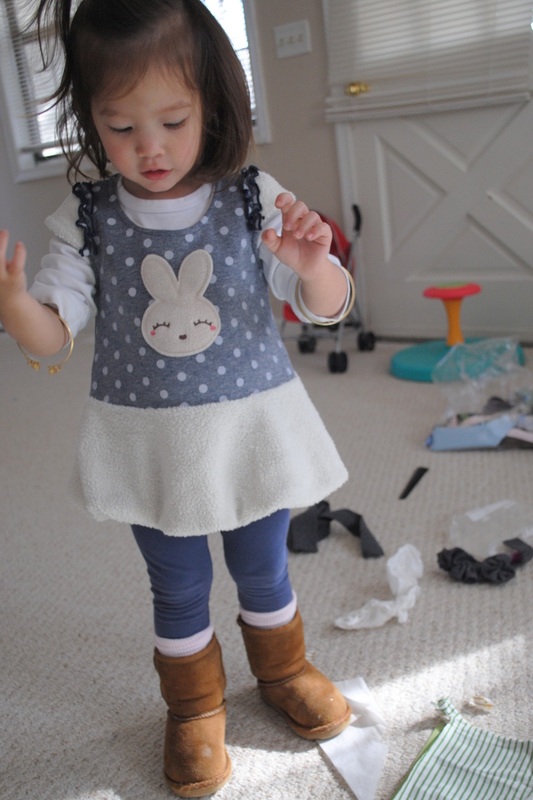 We can typically expect lots of graphic tee-shirts for Jet, and for Avery its girly-girl to the max! I think it is fair to say that Arlene’s taste is sparkalicious. In fact, she crafts in sparkles every day (I plan on featuring her work with Swarovski crystals in an upcoming post, look out.). We love that her hairstyle is different every time we visit, often shades of purple! You get it, she rocks. 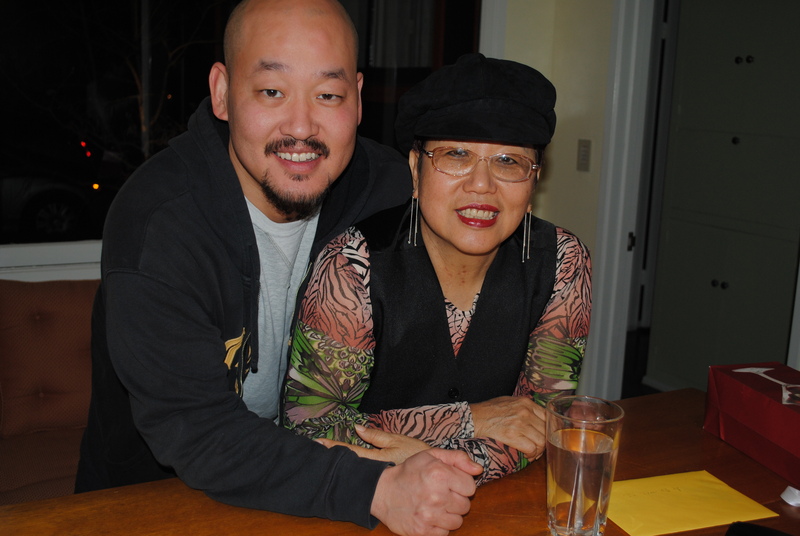 Here she is with my hubby. I actually really like these pants, they are lined with microfleece on the inside. Avery is clearly not a fan. There was a gender ambiguous tee-shirt in the box this time, I think meant for Jet, judging by the size. But he wanted nothing to do with it. 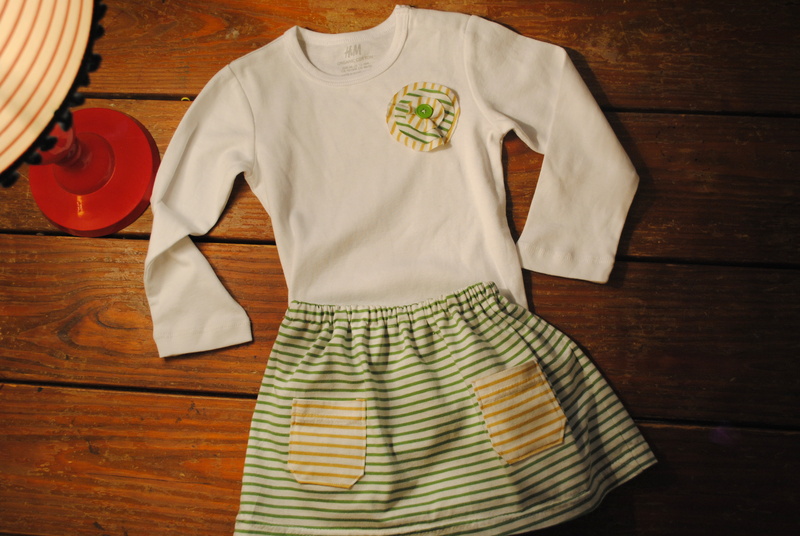 It was just begging to be turned into a hip little mini skirt for a sweet baby girl I know of. I think the fabric must be interlock jersey (I am learning from Rea’s Kniterview series) because it is very sturdy with a nice stretch to it. Below is the already severed shirt, I forgot to take a “before” photo. 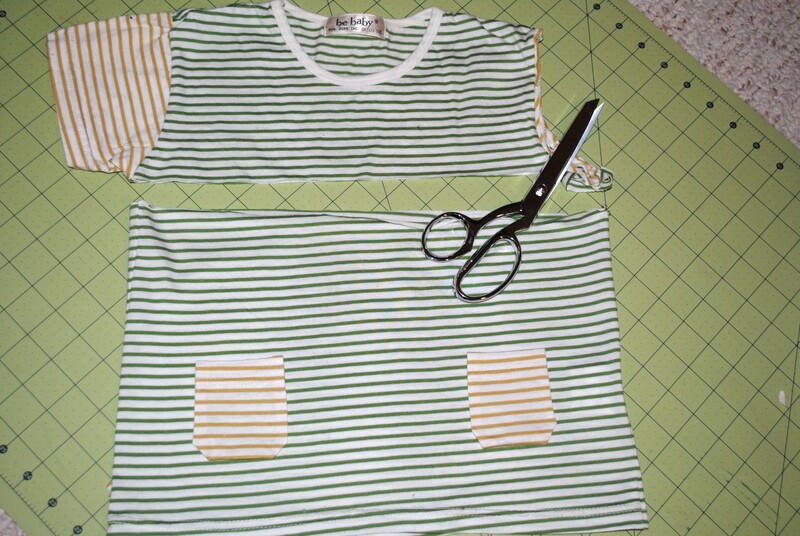 The simple pockets are made from the one missing sleeve, using the hem as the pocket top. She can “keep her weed in there” (I’m sorry I had to. It’s funny because this is for a baby.) . I included a tag for a more signature look. I was imagining this skirt would fit a 6 month old, but I suppose I was a little off, seeing how easily Avery slipped into it. Maybe more like 12-18 month size. I picked a white onesie out of my stash, and made a little embellishment out of the leftover jersey. I think this outfit will be worth waiting a year for, don’t you? 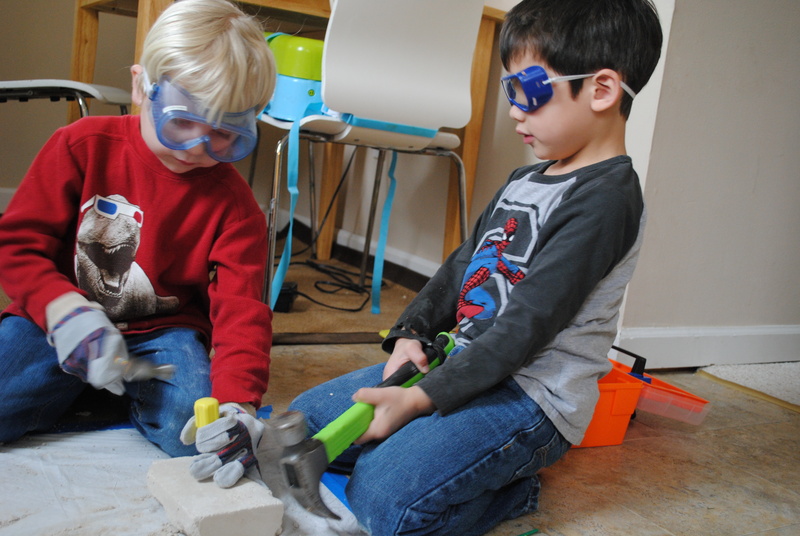 And now, since he doesn’t get much bloggy-love, a photo of the Jet-man with his buddy Sam. Next project is for you kiddo! 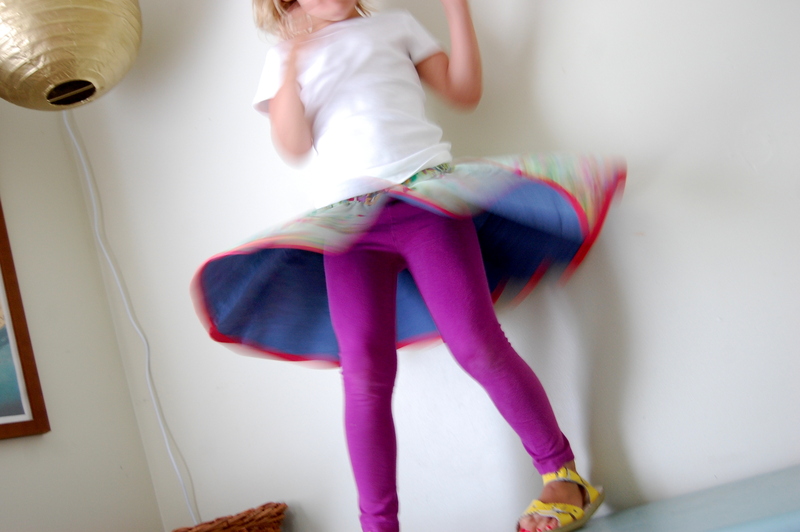 If there’s one thing my darling daughter needs, it’s a full, twirly, fancy tutu for Christmas. She is the dress-up queen in these parts, but unfortunately has worn all of her tutus and dresses to the point of no return… if you saw her cinderella dress, you’d probably think I don’t brush her teeth, or wash her hair. It’s pretty torn up- luckily, she’s been very specific about her wants from Santa. More dress-up. I don’t think I have the energy to create a dress a la Glinda the good witch (her new fave lady)…. But a tutu? 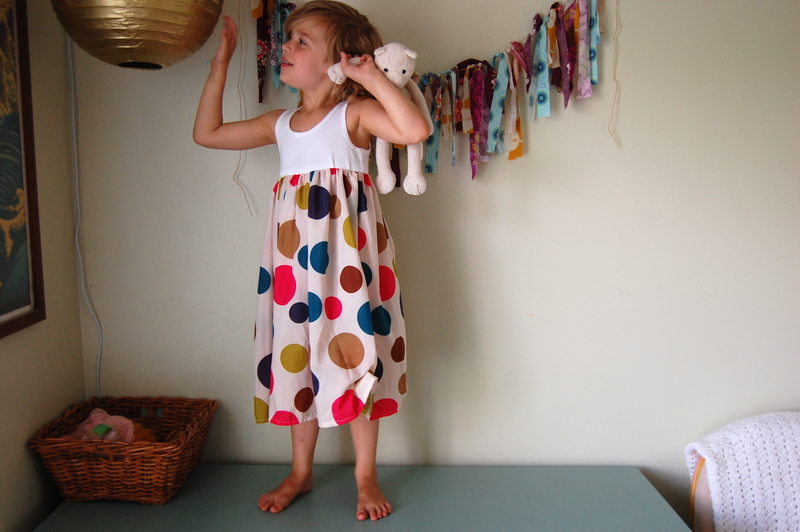 I used a pattern from the book Oliver + S Little Things to Sew which is chock full of great things to make for children. I’ve already made the bucket hat for Grant this past Summer, and I have another project from the book in the works for Ellery. 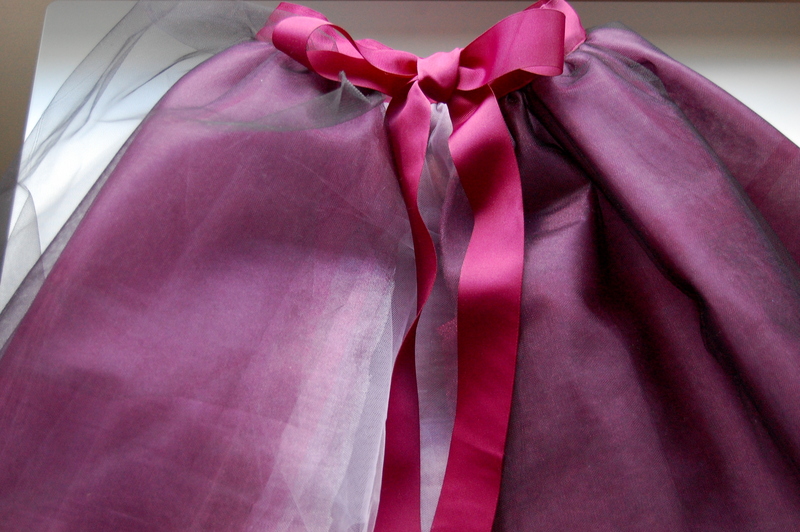 Anyway, this particular tutu is made with 5 different colors of tulle, folded over at the waist (so yeah, actually 10 layers when finished), gathered at the fold, and sewn onto a wide piece of grosgrain ribbon. I would say this was an somewhat easy project- but at the same time, to work with mountains of tulle for the first time wasn’t something I was used to. I used a size 10 needle (i generally use a 12), but that’s really the only thing I changed from my normal sewing. 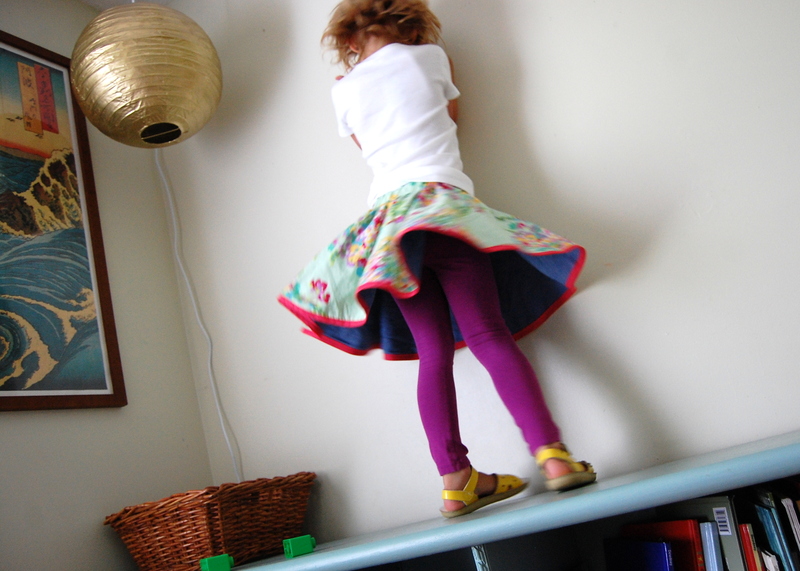 I love that the tutu is longer than most, and that it has some serious volume. 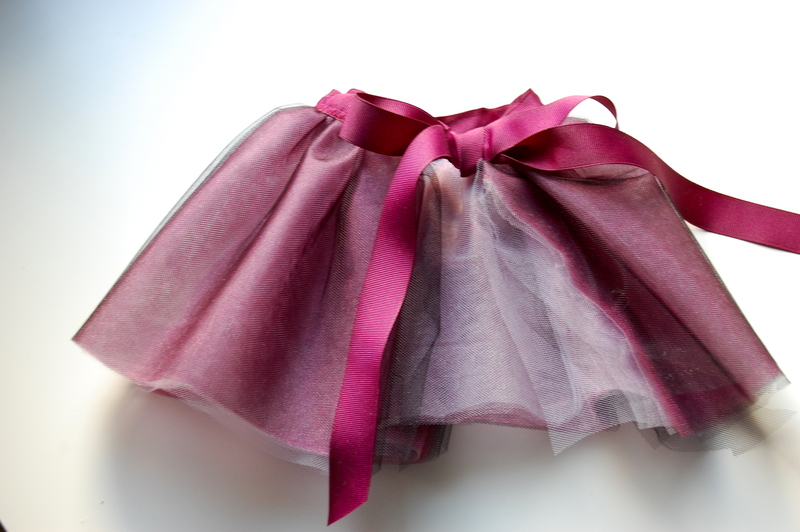 I wanted to stay away from the typical ballet pink, mostly because I had already bought a black leotard and I was feeling a little black swanish that day… I found the burgundy ribbon on sale at Michael’s and was inspired to make her tutu eggplant colored- I lucked out at Joann’s one day- all of their tulle was 60% off. sa-weet!. 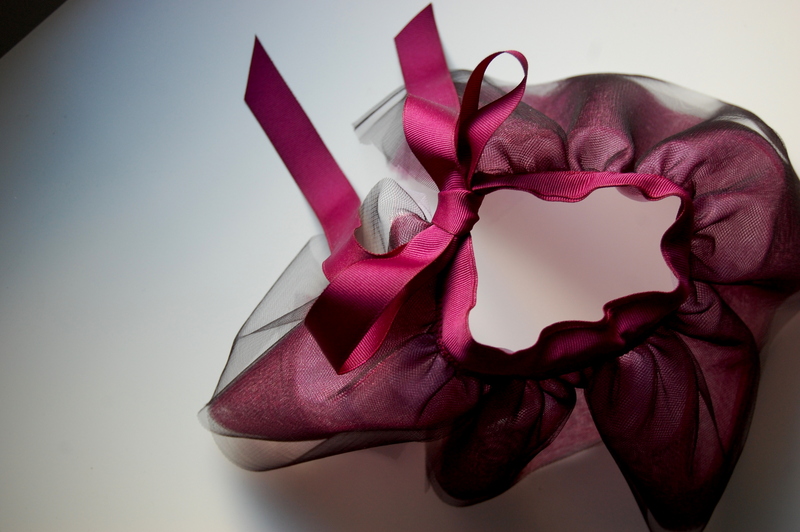 The undermost layer of tulle is very pale pink, then it goes into a ballet pink color, burgundy, deep purple, and finally black. I seriously cannot wait to see my child prancing around the house in this. A mini version for her baby doll. I had so much tulle left over, and I happened to buy the same color ribbon in a smaller size since it was a steal, so it was a no brainer… and seriously, this came together in like 15 minutes flat! Don’t worry. I’m stopping there. I don’t think anyone wants to see me walking around in a maternity tutu. …Well, Ellery would I bet! Ain’t she purty??? 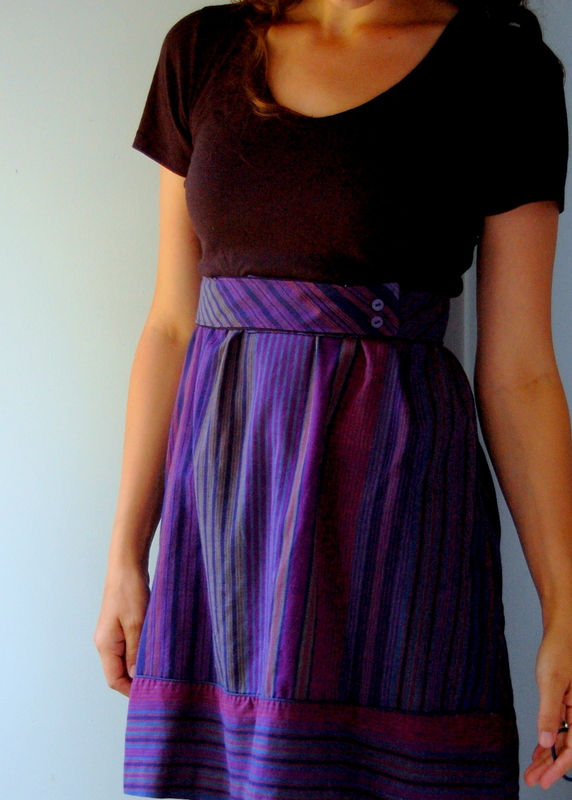 I liked the stripes a lot, the fabric is nice and thin, and it moves easily. It was really had to part with those sleeves…. but I decided to hack it up and just use the skirt. Basically, I cut off the skirt and attached it to a black T-shirt that I had. I tried on the shirt, pulled the skirt up to where I thought the waist should be (I opted for a high-waisted dress here). I marked where I thought the two should come together, then cut the bottom half of the shirt off. I then did two rows of gathered stitches on the top edge of the skirt. 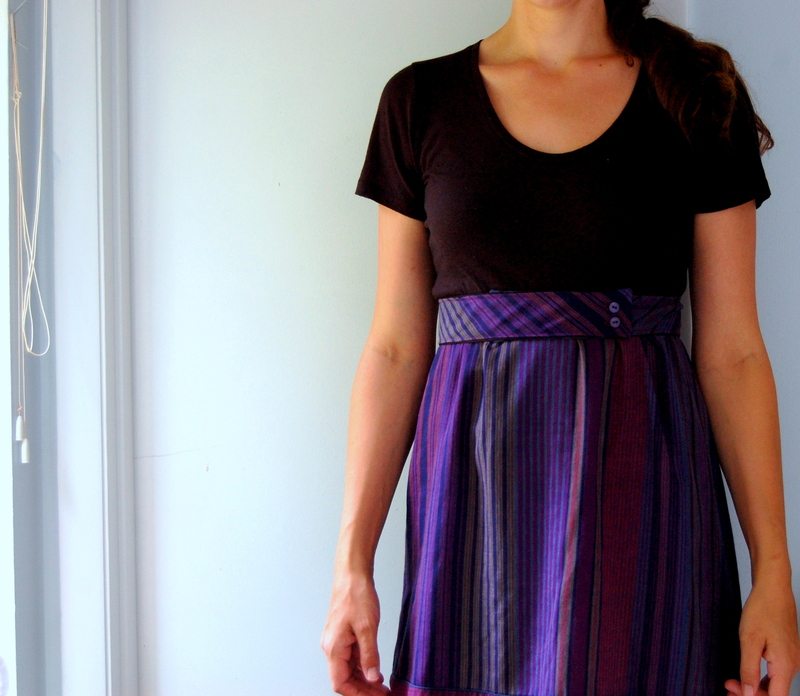 I stuffed the shirt into the skirt and lined up the raw edges (you end up sewing the right sides together). I used my serger to keep the seam nice and neat inside. Then, I pulled the shirt back out to reveal my new and improved dress. No hemming required. 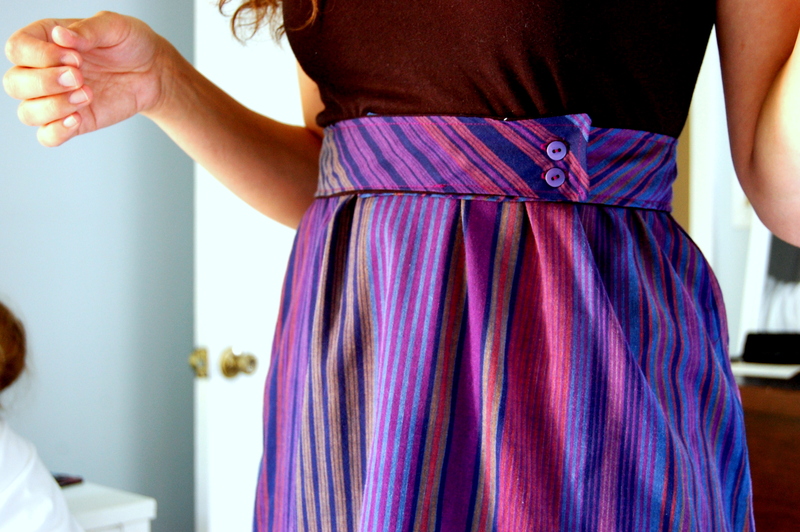 I had to make a little belt out of the top part of the old dress, because the seam where the shirt and skirt meet looked a little bumpy. 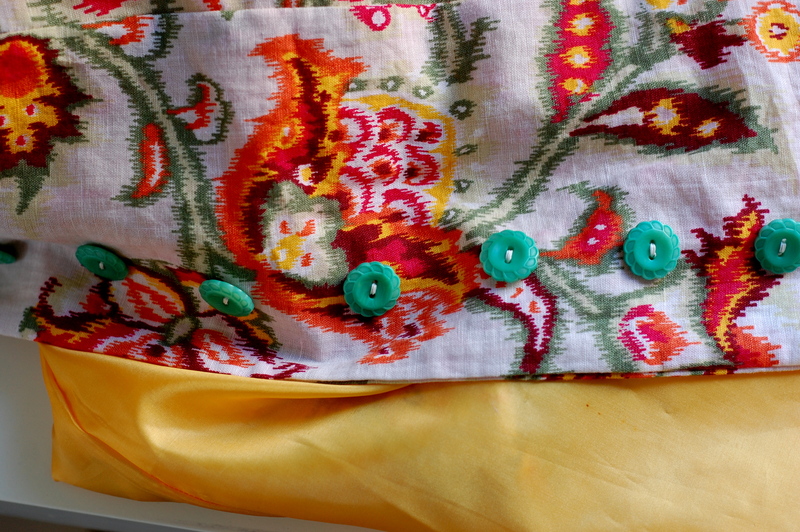 I put a couple of buttons (taken from the shoulder of the old dress) off to the side and sewed a couple of buttonholes. Caroline suggested that maybe I add a couple more buttons to the other side so it looks symmetrical- what do you think? I kind of like it off center, but maybe it would look better? Do the buttons to the side look intentional or does it look like I need to adjust my belt? 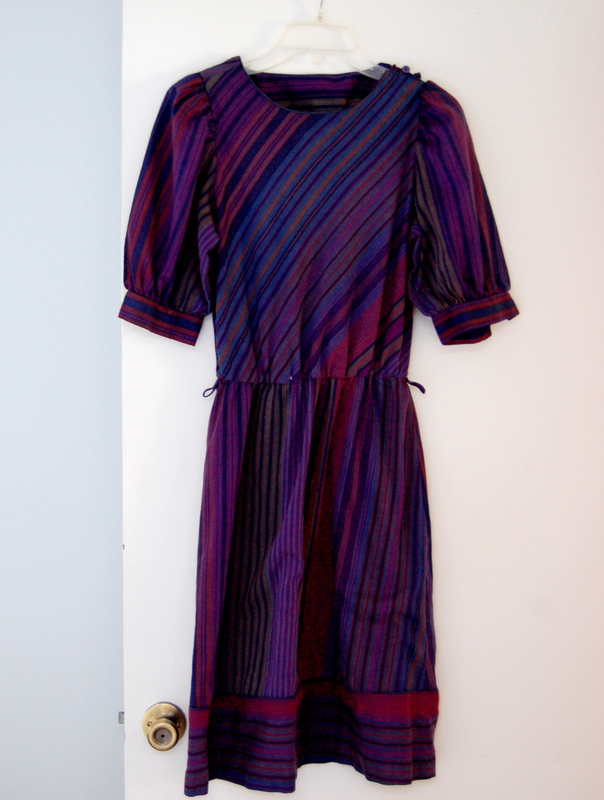 I’m very happy with my thrifty find, and my new dress. It’s comfortable and it was pretty much free. And I’m all about free these days! Amen!